It only takes 30 minutes to improve your outlook for life. If you wear glasses or contacts, you know how inconvenient they can be when you are working out, skiing, swimming or tasks requiring you to change from close-up vision to seeing at a distance. If you crave the freedom of waking up to a clear view of the world, you should look into No Blade Lasik. We can improve your outlook almost instantly with this safe outpatient procedure. At your first Lasik eye surgery appointment, our ophthalmologist will do an eye exam and review any current prescription medications you may be taking. Together, you’ll discuss your general health to make sure you are a good candidate for Lasik. The doctor will ask if you have any eye issues, such as chronic dryness, that need to be cleared up prior to surgery. At this visit, we encourage you to ask lots of questions about your upcoming no-blade Lasik surgery. 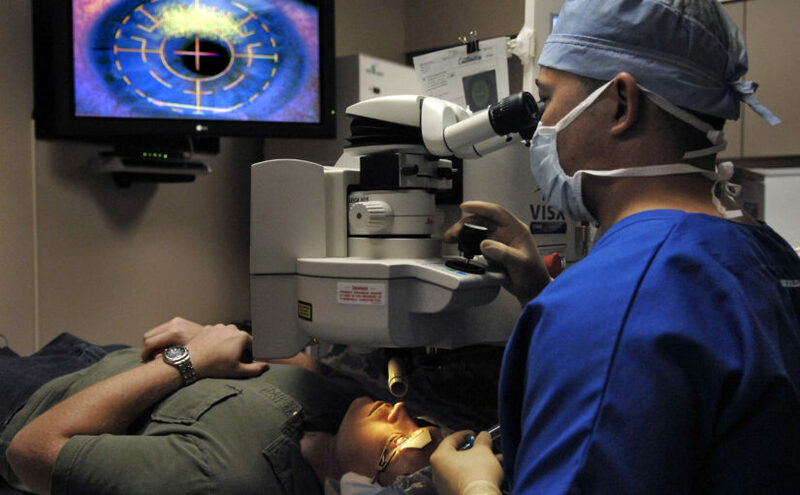 Lasik eye surgery is an outpatient procedure that takes about 30 minutes. You should ask a friend or relative to drive you home afterward because your vision is likely to be blurry and very sensitive to light. You will sit in a reclining chair near the Lasik apparatus. We’ll put some numbing drops into your eyes and clean the area around them. We’ll use a lid speculum to gently hold your eyelids open. You will be awake throughout the procedure. Right after No Blade Lasik, your eyes will feel irritated. The worst thing you can do is to rub them because that could dislodge the corneal flap. Left alone, the flap will heal naturally without stitches in a few days. An over-the-counter pain reliever should relieve any mild pain. You should call us right away if your pain is severe. You will likely experience extreme light sensitivity immediately after your procedure that tends to go away after a few hours. Most ophthalmologists recommend taking a nap shortly after your surgery to allow the eyes to heal and avoid any unnecessary eye movement. Upon waking up, you may find that you are already able to take advantage of your improved vision! Your first post-op visit will take place within a couple days of your surgery. Be sure to keep your follow-up appointments throughout your recovery and follow your doctor’s recommendations. In return, you will enjoy improved eyesight for life. Contact us today to arrange your initial LASIK consultation. I want to have Lasik done, but I don’t know what kind of procedure to have done. I didn’t know that you could have it done with a laser! That seems like the best option.